Here's post number 2 about my dinosaur hunting trip. I present, Tuesday. 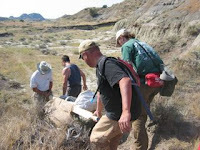 Tuesday we headed out to the Triceratops site. This was very neat to see, though a bit confusing as the skeleton was not complete. I know what a sacrum and ilium are but I'm guessing the kids didn't. I would include a photo but unless you know what you are looking at it just looks like a shot of the ground. 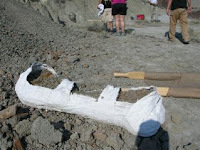 The previous day, a group had made a plaster field jacket for the triceratops femur so we helped haul that out. It was very heavy. That's me on the back right getting ready to lower it down a small hill. I think the dark blotch on the horizon might be the truck we're carrying it to. The field jacket consists of a 2x4 for support, some foil and a lot of plaster strips. FYI: The stylish latex gloves are actually to keep paint and chemicals off my hands as we were making plastic casts of dinosaur pieces on the table in the background. Later that day we climbed to the top of a butte and felt one of the strongest winds I've ever felt in my life. I took this clip of video but it doesn't do the force of the wind justice. You can get a good view of the basin we are about to descend into as I pan across the landscape. This is my first ever video in a blog post. I'll have better ones in the future! At one particularly interesting site after lunch I picked up some broken pieces of fossil that had washed into a small wash coming off a hillside. Since the pieces were found close together (within a five foot stretch) and all appeared similar I put them into their own bag and asked our leader about them. He said they were from a turtle and that I could keep them as they were just broken scrap type pieces. I took them home and to my delight two of the pieces fit together. As I played with them a second piece fell into place and then a third, then a fourth. All in all there were 18 pieces and 9 of them fit together. That's pretty impressive. What I can tell is that it is a portion of the anterior right plastron of a turtle. I have one piece of carapace as well. 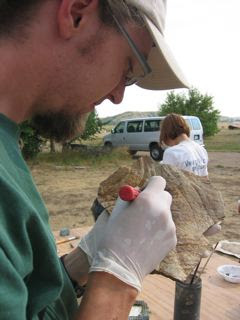 You can see the curved up portion where the plastron would have connected to the carapace of the turtle. It seems about twice as thick as the trionychid shell pieces we found so I need to do some digging to get and idea of what species I'm dealing with. My impression is that trionychid turtles did not have such solid plastrons. I'll post pictures at some point. That's all for Tuesday. More to come later! I like that triceratops have "frill". It makes them sound so wussy.